Edifice has provided support for Alexander Youth Network for over a decade and this year we are pleased to serve as a Visionary Sponsor through our 40UP program. Alexander’s mission is to provide quality professional treatment to children with serious emotional and behavioral problems. They deliver an effective and efficient array of services, enabling children and their families to exercise self-determination, achieve their potential, and become positive contributors to society. Alexander was founded in 1888 in Charlotte as a women and children’s rescue mission. In 1946, the agency began serving children with emotional and behavioral problems and now serves approximately 8,800 children a year in more than a dozen programs. Through our sponsorship, we provide financial support for the Celebrating our Kids luncheon. 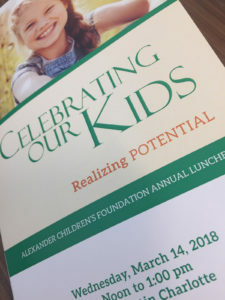 This luncheon serves to raise awareness of childhood mental illness and to raise the necessary funds to continue serving these children and their families. Edifice encourages other organizations to support this worthy non-profit.